Cubresa Booth 207 at WMIC in New York | Cubresa Inc.
Jacob Javits Center in New York at night, the venue for the 2016 WMIC Annual Congress & Exhibition. Cubresa will display the NuPET™ MR-compatible PET scanner in booth 207. 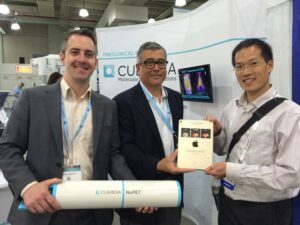 Cubresa Apple® iPad™ Pro winner, Dr. Patrick Chow, at WMIC booth 207. Left to Right: Michael Simpson, Director of Marketing, George Abe, CEO, and Dr. Patrick Chow, Principal Scientist, Preclinical Imaging at Bristol-Myers Squibb. UPDATE: Congratulations to Patrick Chow of Bristol-Myers Squibb, on winning our custom-engraved Apple® iPad™ Pro in the booth on Saturday. Dr. Chow was selected at random from attendees who participated in our survey. Bookmark this page1To bookmark this page, press the Ctrl (PCs) or Command (Macs) and “D” keys on your keyboard. because we will be adding more information up to and during the congress. Come visit us in Booth 207 at the Jacob Javits Convention Center in New York, September 7 to 10, 2016 where we will be showcasing our NuPET™ in-bore PET scanner for existing pre-clinical MRI systems. Above: C57BL/6 mouse bearing a C3 (cervical cancer) flank tumor injected with approximately 17.5 MBq of 18F-FDG. Left to Right: MIP, Coronal, Sagittal, and Axial views. Images courtesy BIOTIC. was used to construct a map of relative vascular permeability. Images courtesy of University of Arizona. Make an appointment to speak with us about your preclinical imaging needs. We believe that simultaneous PET/MRI imaging offers a unique opportunity for analyzing and understanding links between molecular mechanisms and functional phenomena within living organisms.